Last week I had a salesman come to my home and show me samples of flooring. The whole deal had to take place in two days. I told him I wanted to wait until this week for installation but he said the sale price would be gone. I asked about having a small area of tile taken out but he said that it would be fine with the flooring. I disagreed but he didn't listen to anything I said. I told him we couldn't be home before noon on Friday and he said that was fine. After we got all the paperwork done, he told me that he forgot to add on a $298.oo charge and he was going to be in trouble with his manager, so I let him add it on. He said the baseboard would be replaced with some half-round molding. Friday came and I got a call at 9:00 from the installers - they were at my house. They could not wait until noon so I had to leave work and come home to let them in, They insisted the tile had to come out and I had to pay an extra $100 for that. They finished at 9:30 P.M. The baseboard was still on and the half round molding was nailed to it. It looked awful. I called the salesman that night and the installer spoke with him. I have called and e-mailed Empire Today everyday since then and I get no response from anyone. Do not use this company - they are not interested in making the customer happy. I wish i had never called them. I am sick every time I look at my horrible floor and when I think of all the money I wasted on this floor, especially since I will have to go somewhere else to have it done right. Review #147818 is a subjective opinion of jbrock. Hey, I'm currently an employee and I have to say that I'm sorry for you folks who had a bad experience but really, Empire is a great company. What happened to you folks is unfortunate and a misrepresentation of the company. yes, you had an UN-honest sales contractor enter your home and yes, they tried to charge you more then what they should...BUT THAT WAS THE SALES CONTRACTOR!!!!! NOT EMPIRE!! !Us contractors work WITH empire. Not FOR them. therefore the contractor can charge whatever he or she wants. That's not what empire is about. i can tell you that this could happen anywhere.Ex, everybody loves the restaurant Denny's. if you go to eat out at Denny's and you love it, but then you get ONE sever that is rude to you and provides bad service and over charges ur bill etc.. are you never gonna eat at Denny's again??? 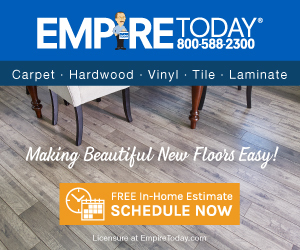 how do you think a 50 year old nation wide company is a rip off when there prices are pretty close to some of the biggest home improvement chains out there in the U.S? I always have happy customers and plenty of return business and referrals. SO PLEASE, its not empire, Its the Sales Contractor ruining our reputation. Just like there's good cops and bad cops, there's good contractors and bad ones. thanks for reading. Hey man I sorry you got taken by this company I am a former employee and this is normal practice for them. In the future steer clear of them.